Abstract: Objective To investigate the effect of the Notch signaling pathway on the proliferation and invasion of human SW982 synovial sarcoma cells. Methods SW982 cells and normal human synovial cells were routinely cultured, and the expression of proteins related to the Notch pathway was compared. 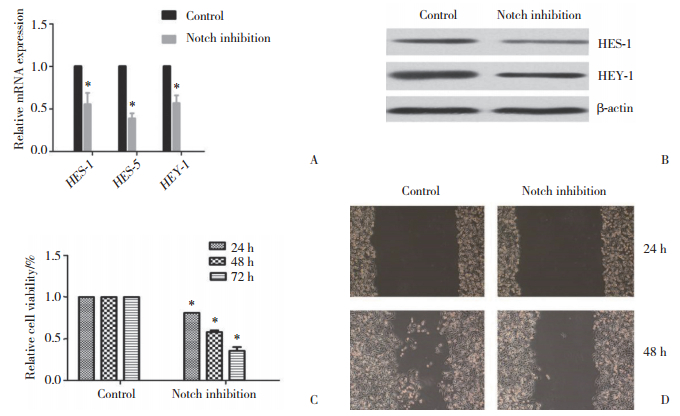 The Notch signaling pathway was manipulated by NICD1 overexpression, CFB1 shRNA lentivirus, and the γ-secretase inhibitor, DAPT. CCK-8 and wound healing assays were carried out to investigate the role of the Notch signaling pathway in SW982 cells. Results The Notch signaling pathway clearly showed higher activity in human SW982 synovial sarcoma cells than in normal human synovial cells (P < 0.05). The proliferation and invasion of SW982 cells were significantly upregulated by overexpressing NICD1; however, were suppressed by downregulating the Notch signaling pathway using CFB1 shRNA or DAPT (P < 0.05). Conclusion Our findings demonstrate that the proliferation and invasion of human SW982 synovial sarcoma cells are dependent on Notch signaling pathway activity. SAITO T. The SYT-SSX fusion protein and histological epithelial differentiation in synovial sarcoma:relationship with extracellular matrix remodeling[J]. Int J Clin Exp Pathol, 2013, 6(11): 2272-2279.